Medallion pattern flags are some of the most beautiful of all antique American flags. 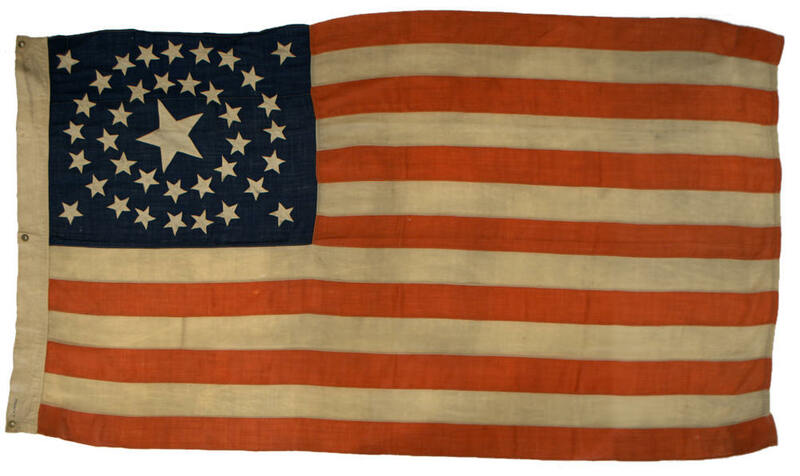 This flag of 38 stars embodies the pinnacle of medallion flag making, during the period inclusive of the American Centennial celebration of 1876. The grand, large center star, representing Colorado, is surrounded by an inner wreath of 13 stars, representing the 13 original states. The outer ring of 20 stars is then flanked by four corner stars. While the presence of corner stars on a medallion flag is somewhat common, I always wonder at its symbolism. Although its possible they merely balance the composition and fill the void, I also believe they symbolize the idea of "sea to shining sea"; anchoring all four corners of the nation and in some ways, symbolic of America's expanse north, south, east and west. For this flag, the maker allowed the stars to "dance" or rotate in various directions, and subtle variations in spacing also add to the flag's folky feel. The unusually wide hoist is an interesting characteristic, and adds to the flag's elongated style. The entire flag is machine sewn, and a light stencil on the hoist is good indication that the flag was manufactured and sold, not homemade. The stars of the flag are stitched using a lineal stitch around the edges of the flag, which is a technique most often seen in the period from the Centennial to the mid-1890's.. The flag is in an extraordinarily state of preservation, appearing nearly new. Family lore surrounding the flag is that it was once in the possession of William "Buffalo Bill" Cody (b. 1846, d. 1917), and a name on the hoist, written in later period ink, reads "C. H. Decker". Although a personal connection between the flag and Buffalo Bill can most likely never be made positively, the family lore is credible. The flag descended in the through family of Bill Cody's youngest sister, Mrs. May (Mary Hannah) Cody Decker (b. 1853, d. 1926). According to accounts of the day, Bill often took May with him on trips across the plains, and the two were extremely close throughout life. Bill died at May's home in Denver, Colorado, on January 10, 1917 at the age of 71, and it's very possible that this flag belonged to Bill at one time and was among his personal effects at the time of his death. The blue colored ink of the name written on the hoist is later period, and does not date to the age of the flag (1876-1890). Most likely, a Decker family member wrote their name on the flag at a later time. Learn more about Center Stars.